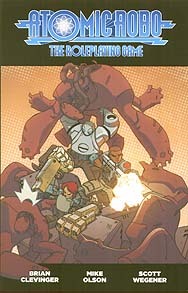 The Atomic Robo RPG brings you the most explosive Fate Core System experience yet. This is action science like you've never seen it before, coming straight at you from the pages of the popular Atomic Robo comics by Brian Clevinger and Scott Wegener. Play as an Action Scientist or immortal robot, super-spy, or pulp adventurer - or something stranger still from the hidden corners of super-science! This is multi-era, pick-up-and-play gaming at its best: get playing in ten minutes, or take your time and make the most of behind-the-scenes rules for added depth. Hop into your Tesladyne jet and travel the globe in one time period, or battle across the decades as a cast of scientifically talented adventurers. Face down demented dinosaurs, rogue government agents, and stolen, Tesla-powered technologies!